Wood has never looked so good – Exterior Wood Ceilings by Hunter Douglas .. The Hunter Douglas Architectural range of exterior wood ceilings, are available in a wide choice of solid wood, veneered wood and metal woodprint finishes. They are ideal for external environments where open, light construction are desired and create a warm and unique appearance to a range of external applications including, soffits, canopies, walkways and atriums. They are available in different panel sizes and configurations and include curved finishes, straight or diagonal patters or a combination of the two. Panels can be specified in open or closed formation and a range of carrier systems provide the designer with a myriad of ideas for both ceiling or wall cladding finishes. 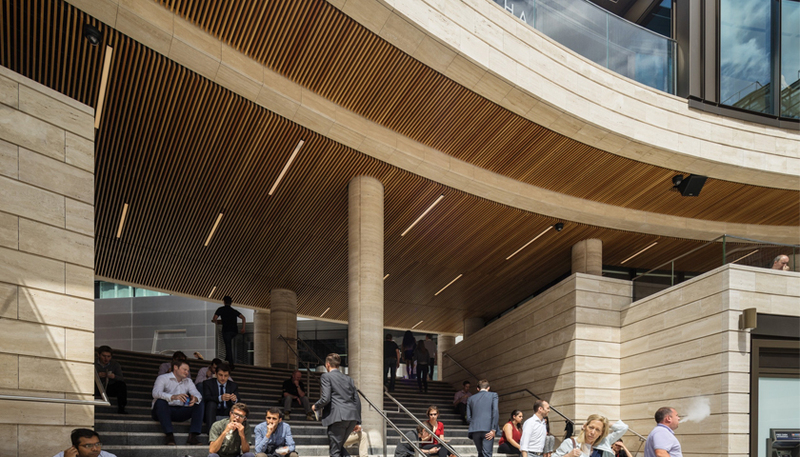 A multitude of finishes are available across the exterior wood ceiling range, including over 20 species in the solid wood range, 40 veneer finishes in the veneered wood range and five standard woodprint finishes in the metal woodprint range. To find out more about exterior wood ceilings by Hunter Douglas, please click here.